Years of experience in supporting studies and improving lab routines. Scientific and productrelated questions of all users - lab and R&D experts - will be answered by our scientists. They know your routines and can thus perfectly support your daily operations. If you intend to train your employees regarding the following subjects then, please, contact us to determine what might fit at best. The workshops and seminars usually take place in our facilities and laboratories. The number of participants should not exceed 12 attendees. Because of the rapid development of ß-Lactamases antibiotics resistency at gram-negative bacteria - ESBL, MBL, AMP-C, KPC, OXA-48-like und D-Carbapenemases - its resistency determination with the particular resistency mechanisms become more and more complicated. The objective of this seminar is to gain deep insights into ß-Lactamases resistencies. Efficiency, legal certainty and quality must be consistent with each other in a laboratory. 26.07.2017 | Dr. Esther Pfeil, Managing Director of MERLIN Diagnostika GmbH, commented this acquisition: "We are very pleased to be part of Bruker's microbiology business now, as we have been collaborating with Bruker already for several years. Our product and service offerings in the field of antibiotic susceptibility testing (AST) complement the MALDI Biotyper system for fast and efficient microbial identification. With our proven expertise in the field of AST, we aim to accelerate further assay additions to the MBT-STAR™ consumables portfolio for selected, rapid antibiotic resistance and susceptibility testing on the MALDI Biotyper." Further details about MERLIN’s acquisition by Bruker are provided in this press release. 11.09.2018 | The new two-test-plate MICRONAUT-S Carbapenemases Detection, which is based on broth microdilution procedure, provides phenotypic detection of clinically relevant carbapenemases (type A carbapenemases (e.g. KPC), metallo-β-lactamases, and OXA-48-like type D carbapenemases) in enterobacteria and Pseudomonas aeruginosa. NEW: Phenotypic confirmatory assay of OXA-48-like type D carbapenemases in enterobacteria by the new inhibitor combination meropenem / avibactam and determination of high-level temocillin resistance. Two isolates can be tested per plate. The layout of this special plate is available on request. 05.04.2017 | It's done - we are glad about our new website! It is not only more modern in its design, but also easier to use on all devices. In addition, this website is safer from hacker attacks. What this means, we had unfortunately learned at our previous system. We apologize to our customers and business partners for the fact that our product information was not available or updated for a short while. We would appreciated your feedback about what you like, or what you consider to be worthwhile or what is missing. We are looking forward to any of your suggestions. 01.01.2017 | Last autumn, Dr. Esther Pfeil, Managing Director of MERLIN Diagnostika GmbH, took part in the election to the General Assembly of the chamber of commerce and industry Bonn / Rhein-Sieg. 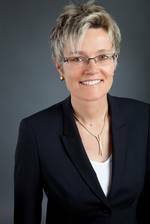 Since January 1st, 2017, she is representing the interests of the manufacturing industry in the Rhein-Sieg area for five years at the General Assembly. Dr. Pfeil decided to present herself as a candidate "since I am a managing director of an SME, I would like to take responsibility for the strengthening of small and medium-sized enterprises (SMEs) and their employees in our region. Subjects, of which I feel touched and which I would like to move forward, are the enhancement of market ability through innovation, the expansion of existing training and development programs to promote skilled workers, and the reconcilability of family and work." 28.11.2016 | Thanks to our microdilution procedure, EUCAST recommends our MICRONAUT products for Colistin testing! 19.10.2016 | The plate MICRONAUT-UR, which is used in the bacteriological laboratory diagnostics for urology, is from now on available with an improved antibiotics spectrum. It has been enriched by the new antibiotic Mecillinam. NRW subsidies for the joint research project "PathoSept"
01.08.2016 | MERLIN Diagnostika is one of the winners of the first round in the key market competition LifeSciences.NRW: Referees voted for the joint research project "PathoSept", which is intended to save many lives by rapidly diagnosing threatening infections. In the key market competition LifeSciences.NRW, 10 joint projects were selected from 51 contest entries, which will be funded with a total of 19.3 million euros. 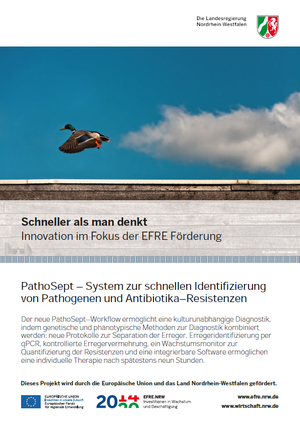 "Winner is also our project 'PathoSept', with which we want to create a diagnostic complete system under the coordination of the Fraunhofer Institute for Applied Information Technology. It very quickly identifies pathogenic agents of life-threatening infections and simultaneously allows a quantitative determination of the antibiotic resistance profile. Based on these results, it can be initiated a targeted individual antibiotic therapy no later than nine hours", says Dr. Esther Pfeil, Managing Director of MERLIN Diagnostika. In addition to the Fraunhofer Institute and MERLIN, the companies Carpegen GmbH, based in Münster, and Jüke Systemtechnik GmbH as well as the university clinics of Aachen and Bonn, belong to the network. The volume of this project is about 3.5 million euros. Every year, more than 56,000 people die from sepsis in Germany, one of the most severe bacterial infections that can be even simply caused by a purulent tooth. Currently, the time between suspected diagnosis and targeted therapy can last up to five days, and infections with multiresistant pathogens can not be adequately treated. PathoSept is intended to open up the reliable diagnosis after nine hours, thus significantly reducing the high mortality rate, but above all the new generation and spread of multiresistant pathogens, as well as the intensive medical costs. With this an infection can be treated very early in the process and very specifically. MERLIN has already made essential preparations for this project because we are specialized in the development, validation and marketing of various microbiological diagnostic systems for the qualitative and quantitative detection of microbial antibiotic resistance. MERLIN's diagnostic systems for quantitative susceptibility testing allow the determination of the minimum inhibitory concentration (MIC value) in accordance with the normative requirements. These systems are supplemented by phenotypic detection methods for the detection of clinically and epidemiologically relevant resistance mechanisms. MERLIN also has a great expertise in the handling of antimicrobial agents, which are meaningful in the validation of the manufacture, packaging, storage and application of antibiotic-containing diagnostics. "These are core competencies that make a decisive contribution to the successful implementation of the joint research project," emphasizes Dr. Esther Pfeil. MERLIN is continuing the development of its products and processes, taking into account sustainability as well as environmental and economic aspects, with the aim of implementing the Antibiotic Stewardship for the rational use of the anti-infectives. MICRONAUT-S MDR MRGN Screening provides, based on the microdilution method, the phenotypic detection of clinically relevant resistance mechanisms in enterobacteria and nonfermenters, including the detection of cephalosporinases and carbapenemases. MICRONAUT-S β-Lactamases provides, based on the microdilution method, the phenotypic detection of clinically relevant cephalosporinases and carbapenemases in entero-bacteria and non-fermenters. The layout of these special plates is available upon request. Gain a deeper insight here, why our ASTroID application is highly appreciated by the experts.